March | 2012 | Reserve Result. On separate encounters, actress Drew Barrymore and designer Jason Wu were spotted at Barney’s New York in Beverly Hills. Design Matters is located at 11527 West Pico Boulevard in Los Angeles, California 90064 @ 310.841.6423. Design Matters is pleased to present the first solo exhibition by Quam Odunsi. 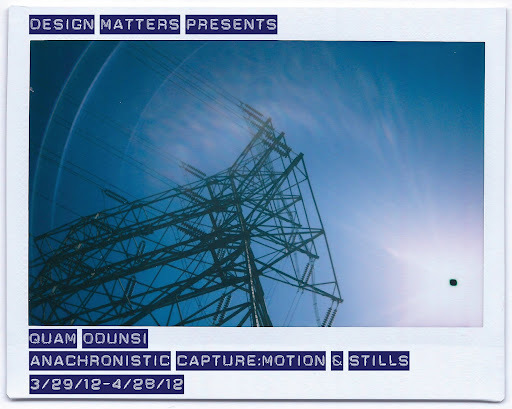 In Anachronistic Capture: Motion & Stills, the Los Angeles-based artist uses vintage cameras and equipment to create motion and stills on celluloid, recording and documenting contemporary subjects with his analog tools from a technological past. Using the city of Los Angeles and its inhabitants as his main setting, he constructs scenes and records the environment as cinematic content on 35mm, Polaroid and Super 8mm film. Quam Odunsi (b. 1982. Chicago, Illinois) is an artist of Nigerian descent who lives and works in Los Angeles. A graduate of UCLA Extension’s Certificate in Feature Film Writing & Directing, he was selected for all four-quarters of the highly competitive and selective art of filmmaking program. He was chosen as part of the six Directors to exclusively premiere their short film – his being Kissed By Season – at the Academy of Motion Picture Arts and Sciences, and shown later at the Sacramento International Film Festival. Borland, Odunsi’s first feature film, was shot on location in the natural surroundings of Texas and premiered at AFI in Dallas. Recent exhibitions include Taco de Lomography at the Lomography Gallery and First Pump at Hold Up Art. You can see a teaser for this show, Anachronistic Capture, here. Design Matters is an independent gallery space in West Los Angeles that serves as a catalyst to the promotion and understanding of contemporary culture. With a focus on both established and emerging talent, we curate and investigate the relationships between art and design through collaboration, technique, and process.